Ruben is a social media manager at KLM Royal Dutch Airlines. 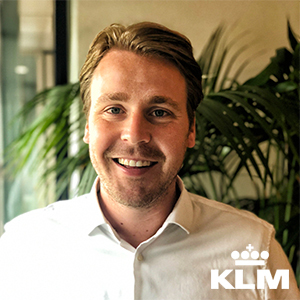 As part of KLM’s social media team, he leads various innovative projects such as sending flight info on WhatsApp and creating bot services for conversational platforms. Ruben is responsible for the development of KLM’s smart assistant BB (short for Blue Bot). BB was launched in 2017 and lives in Messenger and the Google Assistant. Since July 2018, BB can help customers to find a flight on Google Assistant in Dutch and English. Coming months, KLM will launch more voice services to help the customer in a fast, frictionless and conversational manner.